Lake Tahoe, Jewel of the High Sierra! Watershed Area: 314 sq. mi. Lake Tahoe, at 1,644’ deep, is the second deepest lake in the U.S. (Crater lake in Oregon, at 1,932’, is deeper). It is the 11th deepest in the world. If Lake Tahoe was emptied, it would submerge California under 15” of water. There is enough water in Lake Tahoe to supply everyone in the United States with more than 75 gallons of water per day for 5 years. Lake Tahoe is as long as the English Channel is wide. The bottom of Lake Tahoe, at 4,580’ above sea level, is lower than the Carson Valley floor in Nevada. About 2.7 million visitors come to Lake Tahoe annually. The Tahoe Basin is mostly granite, with little topsoil, and therefore few nutrients have washed into the lake to promote the growth of algae and other organisms that make water murky. As well, 40 percent of the precipitation falling into the Tahoe Basin, lands directly on the lake. The remaining precipitation drains through the decomposed granite soil found in marshes and meadows, creating a good filtering system for water. Lake Tahoe’s large volume, relatively small watershed to the lake and the surrounding geology are the primary reasons for its naturally clear waters. Urbanization of the Tahoe Basin has eliminated 75 percent of its marshes, 50 percent of its meadows and 35 percent of its steam zone habitats. About 85 percent of all wildlife in the Tahoe Basin use these habitats. Lake Tahoe is located in the states of California and Nevada, with two-thirds in California. It is fed by 63 streams and two hot springs. The Truckee River is Tahoe’s only outlet and flows from the dam in Tahoe City east through Reno and eventually drains into Pyramid Lake in the Nevada desert. From there, it evaporates into the atmosphere. Lake Tahoe sits at an average surface elevation of between 6,223’, its natural rim, and 6,299.1’ The top 6.1’ of water is controlled by the dam in Tahoe City and holds up to 744,600 acre feet of water. However, water releases are not permitted when the lake surface level falls below the natural rim at 6,223.’ The lowest lake level on record (measured since 1900) was 6,220.26’ on Nov. 30, 1992. 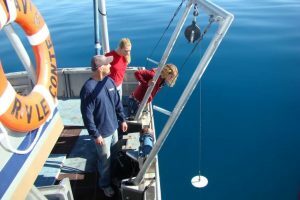 The University of California, Davis, operates the Tahoe Science Center, which monitors, among other things, the clarity of Lake Tahoe. Clarity has been measured since 1968 using a Secchi measurement, which is the point below the lake surface at which a 10” white disk disappears from view. The annual Secchi depth is comprised of about 25 readings throughout the year. The waters of Lake Tahoe were clear to an average depth of 73.1’ in 2015. 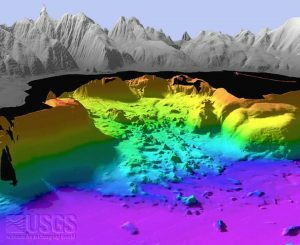 The lowest average depth on record was 64.1’ in 1997. In 2008, UC Davis reported that data since 2001 suggested lake clarity was not declining as fast as it had been. That encouraging finding is supported by the 2008 average, which is nearly identical to the 2007 average of 70.1 feet. Lake Tahoe is losing clarity because algae growth (fueled by nitrogen and phosphorus). Lake Tahoe and about 10,000 square miles of land surrounding the lake were once home to the Washoe Indians, the native peoples to Lake Tahoe. They once wintered in the Carson Valley and spent their summers on the shores of the lake hunting, fishing and gathering foods for the winter. About 1,500 members of the Washoe Tribe of Nevada and California live on tribal lands known as “colonies” scattered in the Reno, Carson Valley and Gardnerville areas of Nevada and in Woodfords in California. An active tribal government continues to lobby for a land base in the Lake Tahoe Basin. They also work with federal and state agencies and private land owners to protect locations important to Washoe Heritage. The first recorded discovery of Lake Tahoe by white explorers was on Feb. 14, 1844, when John Charles Frémont and Charles Preuss spotted the lake from atop Red Lake Peak. Frémont named the lake “Mountain Lake” and then called it “L. Bonpland,” in honor of French botanist Aimé Jacques Alexandre Bonpland. The name was changed to Lake Bigler in 1857 in honor of Calif. Gov. John Bigler. The lake was renamed Tahoe in 1945. Sources: Tahoe Environmental Research Center, U.S. Geological Survey, “Tahoe Place Names” and David Antonucci (denoted by 1).